Do this tour outside of the peak summer season and you'll enjoy less people on the tour as well as less crowded museums! We are comparing Paseo del Arte Golder Triangle of Art Tour Prices from leading ticket suppliers and Try to find you Cheap tickets prices on the market. The Prado, Reina Sofia and Thyssen make up Madrid's 'Golden Triangle of Art' – These 3 museums are located in 1 area and are considered one of the most important concentrations of paintings in the whole of Europe... On your guided tour you'll be able to see the main highlights from all 3 museums. 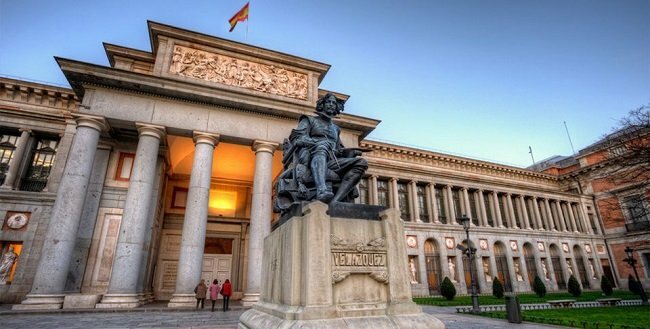 The Prado museum aka Museo Nacional del Prado is Madrid's 200 year old National Art Museum with more than 1,500 works of art on display. This museum focuses on artworks from the 15th to the 19th centuries with paintings by Velázquez, Goya, Titian, Rembrandt, El Greco and Rubens. The Reina Sofia is one of the largest museums in the world for modern and contemporary art and has more than 21,000 works. It has dedicated itself primarily to Spanish art and includes collections from Spain's three greatest 20th-century artists - Picasso, Dalí, and Miró. The museum was officially inaugurated in September 1992 and is named after Queen Sofía. The building has 2 parts, new and old, the historic old section is a former 18th century hospital, today you can still see the vaulted hallways. The Thyssen-Bornemisza museum houses one of the largest private collections of artwork in the world. Give thanks to Baron Heinrich Thyssen-Bornemisza de Kászon, and his son Hans Heinrich Thyssen-Bornemisza who made it their hobby to collect art, without this museum we wouldn't have The Golden Triangle of Art in Madrid. In 2004 Carmen Thyssen-Bornemisza's collection of over 200 works were added to The Thyssen museum. The 3-museum is housed in the beautiful Palacio de Villahermosa, the building remodelled by Rafael Moneo specifically for the Thyssen-Bornemisza Collections. Great if you want to see the most important paintings from all 3 museums in the shortest time possible. A must-do if you're a huge lover of art and want to learn more about the paintings, and the artists, from a knowledgeable guide. You'll be walking between the 3 museums (located within the same area of Madrid) and around the vast museums themselves so make sure you're comfortable with a lot of walking. Predominantly a tour aimed at adults but families with kids are also welcome, just beware that it's a long 7-hour day of art, art, and more art so make sure they can handle it! Your Experience With Paseo del Arte Golder Triangle of Art Tour? Enjoy a guided tour around Madrid's top 3 art museums taking in the highlights of each one. Meeting at 9.45am outside The Prado museum you'll spend 2 hours at this 200 year old museum where you will view artworks covering the 15th - 19th centuries from both Spanish and other European artists including Picasso, Dali, Van Gogh, Velázquez, Goya, Titian, Rembrandt, El Greco and Rubens. See 'Las Meninas' by Velázquez, ''El Jardín de las Delicias' by Bosch, 'The Naked Maja by Goya, and the famous Royal Dauphin's Treasure. The Reina Sofia museum is housed inside a former 18th century hospital. Spending 1.5 hours here, you'll see masterpieces by a number of Spanish and international artists including Picasso, Miro, and Dali. View the famous 'La Guernica' by Picasso and Dali's 'Enigma of Hitler'. Break for lunch where you will separate from the group to visit a cafe/restaurant etc at your own expense, meeting back with the group at 3.15pm outside The Thyssen museum. You'll then spend just under 2 hours at The Thyssen, or The Thyssen-Bornemisza to give it its full name, has artworks from all era's and all genre's. It covers all the historical gaps that The Reina Sofia and The Prado miss out on with collections covering the Impressionism, Post-Impressionism, and Expressionism era's as well as Pop Art and the modern day Avant-Grand movement. At the Thyssen you'll be able to view 'Les Vessenots in Auvers' by Vincent van Gogh as well as paintings by Raphael, Titian, Rubens, Rembrandt, Caravaggio, Manet, Renoir, Cézanne, Gauguin, and Picasso. The tour ends at approximately 5pm. What Paseo del Arte Golder Triangle of Art Tour Includes? Skip-the-line entrance to see the most important works of art from the permanent exhibitions at The Prado, The Reina Sofia AND The Thyssen. Starting at 9.45am, an enthusiastic art historian will be your guide for the next 7 hours as you're guided around each museum being shown the must-see iconic pieces in each. Your knowledgeable guide will explain about the artworks you're seeing, who painted them, and information about the museums themselves. Tour groups are limited to 30 people maximum to ensure a comfortable and enjoyable time for everyone. A lunch break is scheduled where you can go off and buy food, visit a restaurant etc, meeting back with the group at 3.15pm outside The Thyssen museum. The tour will end at approximately 5pm. 3 museums in 1 day – Spend 1.5 hours at The Reina Sofia, 2 hours at The Prado, and just under 2 hours at The Thyssen. Wear comfortable shoes, it's a lot of walking! No food or personal beverages are allowed inside the museums. Travelers Reviews about Paseo del Arte Golder Triangle of Art Tour? Visitors talking about this tour on TripAdvisor, Viator, and Getyourguide all give it a 5 star rating. Travellers are very happy with this tour and report back that the guide is very knowledgeable as well as friendly and that they had a great day out. Some visitors wish there was transport between the museum but this did not detract from them having a fabulous time. All of the museums have wheelchair access. Confirmation will be received at time of booking. Printed tickets and e-tickets are accepted. Plan where you want to eat lunch – There is a one-hour lunch break midway through the tour when the group will separate, regrouping at 3.15pm. Meet your guide outside the Prado Museum next to the Velazquez Statue.